From the first exhilarating step into the soaring space that is Eastern Standard Kitchen & Drinks, it's clear that something has shifted in the Boston restaurant landscape. 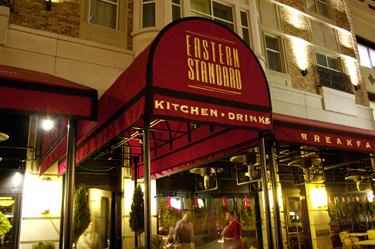 Invoking the past with an elegant timelessness, Eastern Standard opened to white-hot acclaim and is leading the resurgence of historic Kenmore Square. With a dynamic leadership team and a fearless kitchen and bar, restaurateur Garrett Harker has realized the restaurant that has become the gathering spot for the most vibrant cross-section of the Boston scene. Many come for the pristine shellfish of the raw bar and settle into a hand-crafted cocktail at the majestic marble bar. Or perhaps a bottle chosen from one of the city's most extensive selections of large-format Belgian beers. The value-priced wine list with cult favorites culled from all over the world has a dedicated and passionate following. The menu is a broad and evocative presentation of European and American classics integrated with edgy old-world offerings of offal and hand-crafted charcuterie. Or savor our butcher-cut steaks and artisan cheeses from some of the heralded local farmers whose relationships we treasure. Our spacious dining room accommodates large parties, or request a cozy corner banquette for your next romantic occasion. The urban bustle of Kenmore Square is the perfect stage for people watching at Boston's only 12-month heated patio. For your next special occasion, consider Eastern Standard's chic 18-seat private dining room.